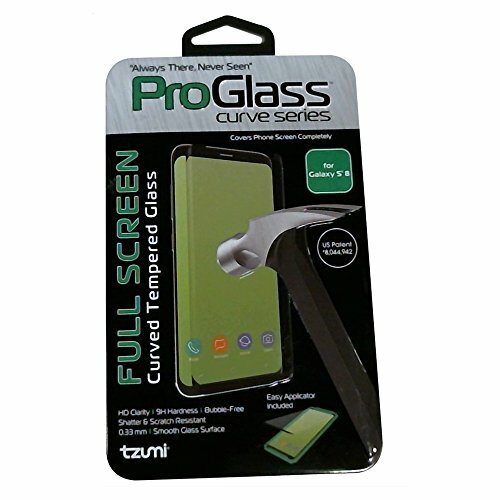 The ProGlass High Definition Tempered Glass Screen Protector Kit by tzumi provides the protection necessary for shielding your Samsung Galaxy S8 Edge Plus from normal wear and tear. Made from heavy-duty tempered glass, the ProGlass measures only 0.3 mm thick and safeguards your device against smudges, scratches, and dangerous and costly shattered glass from a fall. When applied, this super-thin and completely transparent screen protector delivers full screen coverage and allows for maximum touch sensitivity, boasting a hardness level of 9H. Due to its high hardness rating, the ProGlass is your first line of defense for objects like pocket change, safety pins, keys, and paper clips – anything that might otherwise scratch a screen inside a bag or pocket. Perfect Full-Coverage Protection: The ProGlass has been designed to fit and protect the Samsung Galaxy S8 Edge Plus perfectly, featuring triple-layered high definition tempered glass that is curved at the edges to fit the natural contours of Samsung's stunning display. The glass is only 0.3mm thick, allowing for full touch screen sensitivity. Invisible Shield: ProGlass screen protectors are case-friendly, so you have the option of doubling-up the protection for your Smartphone if so desired. Unlike the typical plastic screen protectors, the ProGlass tempered glass provides your phone display with a stronger protective layer and superior scratch-proof and shatter protection advantage. Once applied, the ProGlass has a look and feel almost identical to the bare Samsung screen, so you'll hardly notice its presence. Full Kit Included: Your Samsung Galaxy display needs to be as clean as possible to attain the smoothest invisible fit. While our E-Z Applicator helps you align the ProGlass perfectly to the contours of your Android's screen design seamlessly, we also provide a Dust Removal kit, cleaning wipes, and a soft microfiber cloth to polish and ensure a seamless installation. The tzumi Promise: At tzumi, we are committed to providing you with the very best in consumer electronics accessories. We're convinced you will be more than happy with your ProGlass Screen Protector for Samsung Galaxy S8 Edge Plus, but if you are unsatisfied for any reason, please contact us directly so that we can be of assistance and make it right.